There is one major condominium on Clematis Street, the 610 Clematis Condominium on the 600 block, with over 200 units and an ideal location on Clematis Street but also only 2 blocks from City Place. There is also a substantially smaller building with some condominium units at 101 Clematis Street closer to the waterfront, and a few other much smaller buildings with condo units available on Clematis Street. There are also several other new condominium buildings within a few blocks of Clematis Street. The Whitney (another 200+ unit complex) is located at Evernia and Quadrille, just 2 blocks south of the 400 block of Clematis. The Metropolitan is located at Sapodilla and Fern, just 3 blocks south of the 600 block of Clematis. There are several nice condominiums closer to the intracoastal that are also just a few blocks south of Clematis Street and actually were built a few years before the real estate boom (such as Esplanade Grande and The Strand). 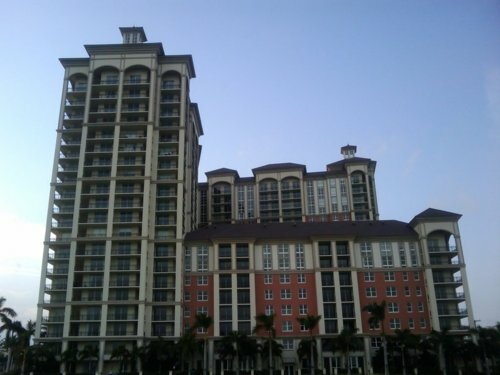 There are also several pre-existing condominium buildings within the City Place complex (such as Tower Residences, Courtyards at CityPlace, CityPlace Townhomes, etc.). And then there are some very large new condominium buildings along the Okeechobee Bouleavard corridor near City Place (One City Plaza, Two City Plaza, City Place South Tower). All these buildings are great places to live because of their great location in the middle of downtown West Palm Beach, where everything is within walking distance. I like 610 Clematis the best because it's the only one within a few blocks of both Clematis Street and City Place. Downtown West Palm Beach is experiencing the same market forces as the rest of Florida in the real estate market. As a result, the current state of many of these buildings depends on exactly when the units were put up for sale. Most of these buildings are relatively new, but some, like 610 Clematis, were already sold out by late 2005, when the real estate market began to crash. Some, like the Whitney and CityPlace South Tower, were just beginning to sell units or hadn't yet started selling units when the real estate market crashed. Both categories of condominiums have been impacted by the crash but in different ways. For instance, 610 Clematis unit owners have been hurt by the decrease in values since their purchase during the boom. But at least there is a specific owner owning and responsible for each unit. As a result, there are no serious problems regarding maintenance fees or upkeep of the building. There is a core group of resident owners that ensure the highest quality services, and those owners that were non-resident investors are generally renting out their units to younger folks who enjoy living downtown (instead of flipping them). So the building is always bustling with activity and owners have been able to pay for the upkeep of all its amenities and services. Search for the perfect vacation rental at Condo.com. In some of the newer buildings like the Whitney and Cityplace South Tower, there are a huge number of empty and unaccounted-for units. This is something to look out for when buying a unit there at the current time -- it will be important to understand what the situation is regarding maintenance fees. If a significant number of units are not paying maintenance, the rest of the units will ultimately have to pick up the slack if the building is going to maintain the same amenities and services. All of these buildings will ultimately be extremely successful because of their great location, but they are certainly experiencing "growing pains" at the moment, with the newest ones (those completed after 2006) generally being in the least favorable situations. Although there has been a lot of press regarding the real estate market and "empty condos", this is only true in downtown West Palm Beach in the sense that many of these condos do not yet have resident owners. There is a large group of people (primarily renters at this point-in-time) that wants to live in these buildings and as soon as the units have become available it has generally not been a problem to find renters. So over time, the lights of the newest buildings are slowly turning on at night, revealing a brand new population of downtown residents. One thing that does remain empty, however, is the commercial space. An interesting feature of all of these new condominium buildings is that they were built with the first floor generally devoted to commercial space. There was already a lot of vacant commercial space on Clematis Street and around downtown, and the new units in these new downtown condominiums also sit empty for the most part. There is certainly some great infrastructure in place for the time when the market finally turns around, but right now, it does not appear to be a fun undertaking to own this kind of commercial space in downtown West Palm Beach. I did notice an interesting positive development however, just this week, when walking down Evernia Street between Quadrille and Dixie. There was activity in five or six of the commercial units in The Whitney on that side of the building, either actual people sitting in small offices, or signs announcing the arrival of a business within the next month. The Whitney must be doing something right with regard to their commercial units -- perhaps it involves pricing that is in line with the current market. Below is a picture of the newest condominium building in downtown West Palm Beach, the City Place South Tower, on Okeechobee Boulevard. This is one of the most noticeable buildings in downtown West Palm Beach, and it can be seen even from 5 miles away down Okeechobee Boulevard to the west (i.e. even from west of the Turnpike). It makes downtown West Palm Beach look like a real city from miles away. However, the building is facing some financial difficulties currently (i.e. there was just a "friendly foreclosure" where the bank assumed ownership of the vast majority of the units from the developer while the developer will continue its marketing efforts).